I added another project to my list, which accounts for not finishing the back of the Twist sweater. However, I did manage to finish the front and block it. I plan to cast on for the back this evening. I'll be attending a wedding in Florida in March and decided I needed to make something to wear to that. The Elderflower tank, from Rowan's Summer Tweed Collection, will go perfectly with this great checked skirt I have. It only takes three skeins of yarn too. Just what I like...cheap, yet stylish. Another reason for less knitting this weekend was beading. I made these four necklaces. The one on the far left is just a rose made of bone hung from a piece of leather. The next one has quartz sandwiched by two mother of pearl stones. 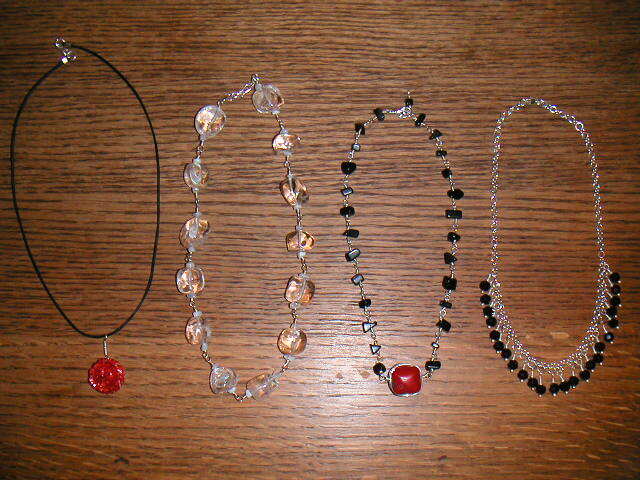 Next, are some black stones with a piece of coral wrapped inthe middle. Last, are some garnet-colored Swarovski crystals attached to a chain.